Thursday April 7, 2016 was cool and drizzly when Sandy walked to the boulangerie to buy a baguette for breakfast. 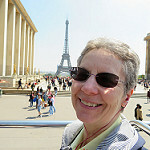 She also bought croissants to take to our French professor Christine and her husband Michel. We think the boulangerie where Sandy buys our croissants (La Fournée Malouine) is the best of all Intra-Muros boulangeries. They seem to melt in your mouth and are very flaky. After breakfast a slight shower is coming down and the sun is still out. Sandy looked out the west windows and spotted a rainbow / arc en ciel. To go to our French lesson we decided to wear our rain coats as there is a small chance of rain. We got the #2 bus at porte Saint Vincent just outside the Intra-Muros and got off at the Gare or train station. We waited about 10 minutes to ride a # 5 bus that will let us off just 2 blocks from Christine’s house. The sun is shining brightly as we arrive at Christine’s house. The two-hour lesson goes by very fast and a lot is covered. Christine used the French TV5 website to show Sandy how she can use the lessons there to augment her learning. Just before leaving, we took a look at the weather forecast as we are ready to walk out of Christine’s door at 12:10. There is a small chance of rain after 13:00. We reach the bus stop in 5 minutes. But we had missed the bus. The next bus doesn’t come for another 30 minutes. We decided to walk 6 blocks to Paramé center to catch a different line. It started to rain. Then it poured! Next it was pouring rain and very windy. Within a few seconds our legs are soaked and very cold. It stopped raining just as we reach the bus shelter. The next bus should arrive in about 5 minutes. As we entered the bus, the driver spoke to Phil to explain something. Phil really didn’t get what he was saying. Halfway back to the Gare, we realized there was a deviation in the route and we would not take the normal route. This was what the driver had been trying to tell Phil. As we headed through the last roundabout before reaching the Gare, we saw a police man blocking the road and several fire trucks with their firefighters in the middle of the street. Later we learned there had been a house fire on the main road and that was the reason for the detour. We rode the last 5 minutes on the bus and reached Intra-Muros without any more rain or delays. We are cold, wet, and very glad to reach our apartment. 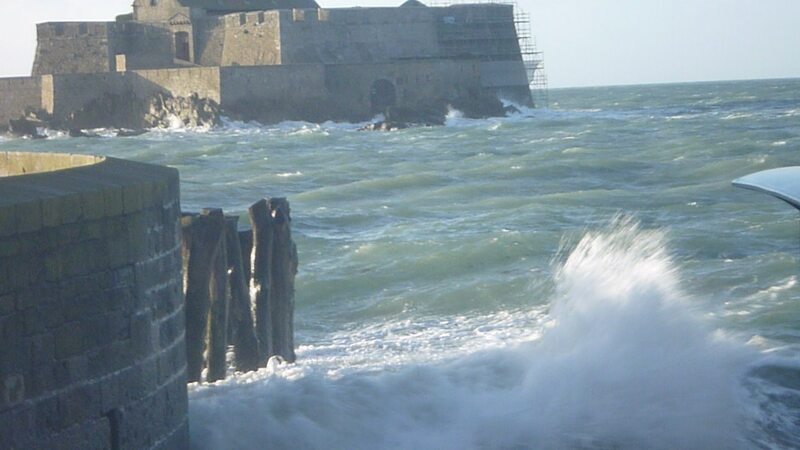 Today had been forecast as one of the days where Saint-Malo has the highest tide of the year. The predicted coefficient is 114 at 20:15 tonight. The maximum height is a coefficient of 119. At 19:30 / 7:30 PM we got dressed to go see the high tide. We put on our rubber boots and rain coats and headed out to the Sillon, the beach area just north of the Intra-Muros castle / château. As we passed the castle / château, we could see the flag of Saint-Malo atop the castle / château. There was a strong wind blowing from the southwest. 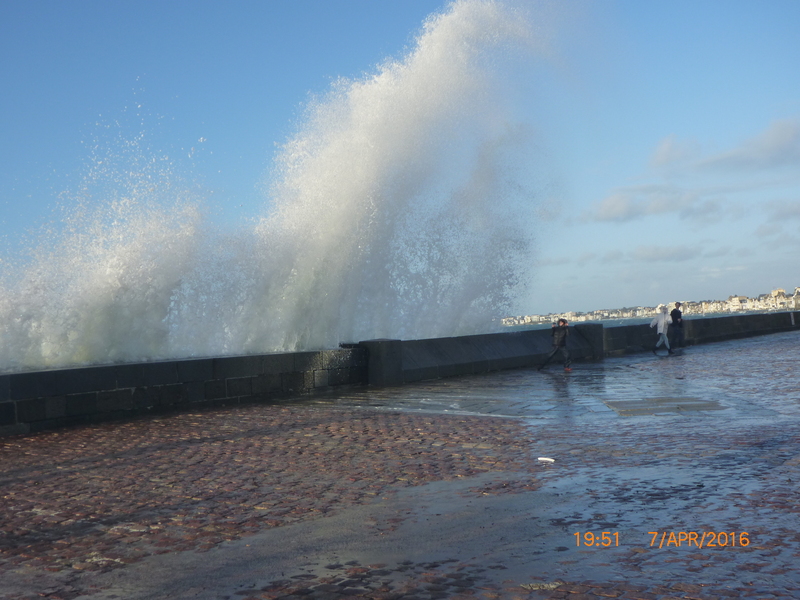 There were quite a few people around watching the waves and getting wet as the waves hit the wall and splashed skyward. We stayed for about 15 minutes and successfully avoided getting soaked unlike the last time we viewed the high tide. That time we were completely soaked, head to foot. We returned to the apartment and had dinner. During dinner we watched Money Drop as usual. One of the contestants was named Philip. He spoke very good French, but with a definite accent. Philip is not a normal name in France as it is usually spelled Philippe. As he spoke in French we could distinctly hear his accent. We knew he was not French. It turned out that the Philip on Money Drop worked in France, but was originally from Yorkshire in England. We then realized how easy it was for the French to spot our American French accent. No wonder they always know we are not French. We have a long way to go with our French lessons. On the other hand, they seem to know we are Americans before we even open our mouths. Maybe we’ll get some insight into that issue later this summer.